CLEMSON, SC – When Julia Stump started looking for employment after earning her master’s degree from the University of Tennessee, there was something at Clemson that stood out. 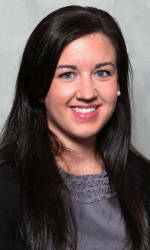 Stump, who also received her undergraduate degree from Tennessee as well, is the new Assistant Director of IPTAY. The former Volunteer has spent the last four years working for the Tennessee Fund inside the Development Department. At Clemson, Stump will be in charge of promoting the Tiger Cub Club, the Collegiate Club, as well as the student rewards program and helping the Annual Fund at certain IPTAY events. A 2009 graduate, Stump thinks her age will help her connect with young people when it comes to recruiting members for the Tiger Cub program and the Collegiate Club. Stump says she has watched a few Clemson games over the years, so she knows how passionate Clemson people are about their Tigers. She says she is already getting a feel for the school and the town and is really enjoying it. Being a frequent visitor to college football games during her time at Tennessee, Stump can’t wait to see what football Saturdays are like in Clemson. As for what she hopes to accomplish with her duties, Stump says IPTAY is looking to split the Tiger Cub Club into three different age groups, targeting more to younger children, and then middle school and high school aged kids. “We are trying to target what they are looking for, in terms of events,” she said. “We want to cater to them and get them a little more involved, especially through high school. I think the transition from high school into the Collegiate Club, and then eventually to IPTAY is what’s really important. Stump says her goal is to make sure young people in middle school and high school understand that the Tiger Cub program is not just for children, but for them as well, that way when they come to Clemson after high school, they can move right into the Collegiate Club.